Dryden High School Online – Page 445 – Building a culture of learning. Sept. 8 Hey everybody listen up! Today at lunch in Room 107 there will be an Envirothon meeting for anyone interested. That’s room 107 @ lunch today. Be there or else! Sept. 8 Reminder to Mr. Lalonde’s PAL 200 class to meet at Riverview Lodge beach volleyball courts for class today. Sept. 8 To all members of the Art Association and anyone interested, there is an art meeting today at lunch. Also, there is an art rep. meeting tomorrow at lunch. The DHS Eagles football team defeated the Beaver Brae Broncos 12-7 in a pre-season exhibition game. The hard-hitting game saw Derrick Tattrie score on a 2-yard touchdown, with Adam Swientek bringing in the rest of the points for the Eagles. The next game is Friday, Sept. 11 at home against the Elwood Giants. Come out and support the Eagles in their 60th anniversary year! Sept. 3 Attention all Music Association Executive members. There will be a meeting today at lunch in the music room. Be there! 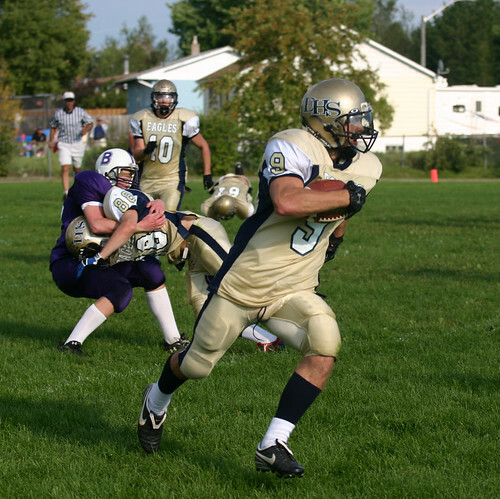 Sept. 1 – 3 The DHS Athletic season begins today with an exhibition football game here against the Kenora Broncos. Game time is 4 p.m. Come watch the hard hitting action and support your Eagles.